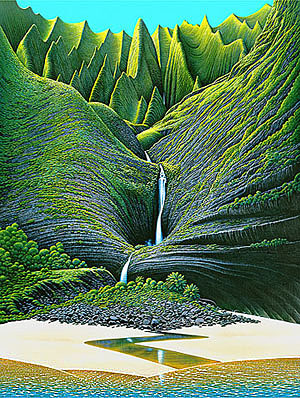 One of Alex's many elaborate watercolor and ink renditions, Destination depicts an actual place in the Hawaiian Islands. The close-ups below show the level of detail in this painting. The selections on the left and center are magnified to slightly larger than the original painting, and the selection on the right is the actual size of the painting. Dimensions of Original: 17.5" x 23.5"